For Bob and Laura Keane, it's all about family; cookouts on the beach with happy kids splashing in the surf, the annual family tennis tournament and generations of extended family simply spending time together. 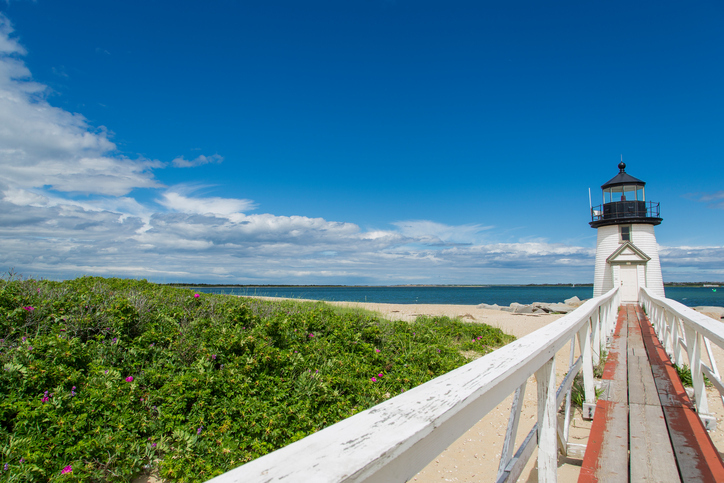 It's why the Connecticut-based Keanes have vacationed in Nantucket, the popular island south of Cape Cod, Mass., for nearly 20 summers, and it's the rock-solid reason they made the decision to build their dream home there now. "We fell in love with Nantucket from the first moment we saw it in 1992," says Laura. "We vacationed there every summer for years, and our kids—Maxx, Chelsea and Sam—were still living at home when we had the opportunity to buy our first vacation home there back in 2009." The kids grew up on the island's beaches and still work in its lively tourist trade. For years, their five-bedroom, mid-island summer home seemed like second-to-heaven. But with the three Keane children and their large circle of friends, plus Laura's nine siblings and their families, and a close-knit clan of extended family who have open invitations to join them, the Nantucket getaway was soon creating memories for more people than it could comfortably hold. "Then, two years ago, we found a two-acre lot that seemed to have our name on it," Bob explains. "It's on a private road, fairly secluded, about a mile from the ocean, and it seemed like the ideal spot to build the dream home we wanted—our legacy for the generations to come." Keane, a reinsurance broker, and his wife Laura envisioned multi-functional open living spaces and an oversized eat-in kitchen, with a master bedroom on the main floor, three en-suite bedrooms in an upstairs wing, a finished basement with a bunkroom and a separate two-bedroom cottage equipped to host an ever-growing guest list. Determined to get the plans right, they interviewed several architects. Ultimately, they placed their faith in Nantucket architect Ethan Griffin. Griffin, a senior architect at Chip Webster Architecture, has been custom designing Nantucket homes for years, and is well-acquainted with the needs and restrictions of building in the historic island district. More than that, Griffin connected instantly with the Keanes' decisive vision. "I saw right away that for this family," says Griffin, "it was more about lifestyle than luxury—about hanging out in comfortable spaces and enjoying nature and one another." It was also a whole lot of fun. "The Keane's lot sits among wooded pines, surrounded by conservation land and winding walking trails, and it was clear from the outset that the family wanted to maximize the area's natural grace and serenity. They have a lively, energetic vibe, and they are open to new ideas. Very quickly, we meshed as a team and we set about designing their dream home." Ideas took shape and initial designs were examined, evaluated and improved. Amazingly, in just under three months, the final plans were approved—a contemporary casual family compound featuring a sprawling, 6,000-square-foot main house with an adjoining cottage, a tennis court and a gym, and plenty of lawn space with lots of seating and a massive barbecue and fire pit. "Our annual fishing trip is a long-standing family tradition," notes Bob. "We want to be able to cook up the catch and enjoy it together outdoors in a comfortable, private setting." As with any project, there was a budget in place, and Griffin wondered, for a time, if he could manage to stay within the Keane's budget and still deliver the desired custom woodwork and other high-end amenities. Enter Nantucket builder Frank Daily. A leader in island renovations and home construction since 1997, Daily and his crew of craftsmen are committed to meeting the most meticulous specifications while preserving the area's culture and integrity—and to doing it while staying on budget. Like Griffin, he tuned in early to the contagious Keane vibe and quickly became a part of the team. "The Keanes wanted the sand in their feet. They envisioned an indoor/outdoor flow built for comfort and convenience, where people can feel at home," Daily says. "They're into beautiful but functional, a low-key lifestyle with high-end touches, and that's exactly what we built." It helped that the Keane's initial Nantucket home sold within the first two weeks on market. "It's a unique property even on this island full of lovely homes—four stories of living space including a finished basement, and lovingly decorated in the fun, beachy style that Laura appreciates," says Bernadette Meyer who, with partner Craig Hawkins of Maury People Sotheby's International Realty, was selected to represent the sale. The home sold, fully furnished and at top dollar for the market, to a family as eager to enjoy its amenities as the Keanes had been for years. "It was as smooth a transaction as I've ever seen," says co-agent Hawkins. "Bernadette and I are proud and happy to have been part of the Keane dream team." The Keane's new home blends easily into its natural setting on the island. Its cohesive, traditional farmhouse design, complete with porch and dormer windows, features unique elements like a practical "beach room"—the Nantucket equivalent of an inland mud room—and a casual, welcoming vibe. Laura Keane, whose discerning eye helped to make the family's former getaway such a highly prized commodity, worked with interior designer Julie Furey, owner of Julians Interiors in Madison, Conn., to ensure the new home carries the same unerring style and ambience. Furey, who has worked with the Keanes before in both Nantucket and Connecticut, is familiar with the family's taste and lifestyle, and is happily in tune with their vision. "We went for clean lines, light, beachy colors, and a contemporary, nautical ambience that reflects the Nantucket environment," she says. "We wanted a cool palette and a light, airy feel that inspires relaxation and leisure." One of the challenges of working on an island, Furey explains, is getting furnishings that have been selected on the mainland delivered in a timely manner. "Nantucket is a three-hour trek from the mainland, including a one-hour ferry ride out of Hyannis," she notes. "It's hard to create an 'instant house' when pieces of your design are still missing." Neither was it easy to manage a huge project from 200 miles away. But the Keanes were both pleased and patient. "We've been lucky to be working with an amazing team," says Laura. "I can't think of a thing we would have done differently." The family, she says, built much more than a home. "It's a special place where all the members of our extended family and friends will continue to gather for generations to come." And this past summer, the Keanes put the design and quality of the home to the test, comfortably hosting up to 19 people at once. According to the couple, "We are very happy with the decisions we made throughout the process, and the various people we worked with to help make our dream come true."